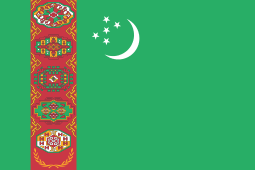 The Ghurids or Ghorids (Persian: سلسله غوریان‎‎; self-designation: شنسباني, Shansabānī) were a dynasty of Eastern Iranian descent (presumably Tajik, but the exact ethnic origin is uncertain), from the Ghor region of present-day central Afghanistan. The dynasty converted to Sunni Islam from Buddhism, after the conquest of Ghor by the Ghaznavid emperor Mahmud of Ghazni in 1011. Abu Ali ibn Muhammad (reigned 1011–1035) was the first Muslim king of the Ghurid dynasty to construct mosques and Islamic schools in Ghor. 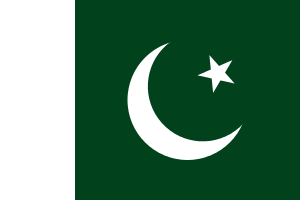 The dynasty overthrew the Ghaznavid Empire in 1186, when Sultan Mu'izz ad-Din Muhammad of Ghor conquered the last Ghaznavid capital of Lahore. At their zenith, the Ghurid empire encompassed Khorasan in the west and reached northern India as far as Bengal in the east. Their first capital was Firozkoh in Mandesh, Ghor, which was later replaced by Herat, while Ghazni and Lahore were used as additional capitals, especially during winters. The Ghurids were patrons of Persian culture and heritage. The Ghurids were succeeded in Khorasan and Persia by the Khwarezmian dynasty, and in northern India by the Mamluk dynasty of the Delhi Sultanate. 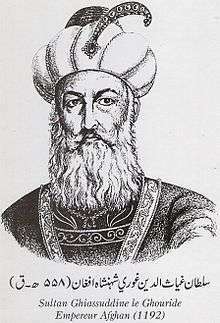 In the 19th century, some European scholars, such as Mountstuart Elphinstone, favoured the idea that the Ghurid dynasty relate to today's Pashtun people, but this is generally rejected by modern scholarship, and, as explained by Morgenstierne in the Encyclopaedia of Islam, is for "various reasons very improbable". Instead, the consensus in modern scholarship (incl. Morgenstierne, Bosworth, Dupree, Gibb, Ghirshman, Longworth Dames and others) holds that the dynasty was most likely of Tajik origin. Bosworth further points out that the actual name of the Ghurid family, Āl-e Šansab (Persianized: Šansabānī), is the Arabic pronunciation of the originally Middle Persian name Wišnasp, hinting at a (Sasanian) Persian origin. The Ghuristan region remained primarily populated by Hindus and Buddhists till the 12th century. It was then Islamised and gave rise to the Ghurids. The rise to power of the Ghurids at Ghur, a small isolated area located in the mountain vastness between the Ghaznavid empire and the Seljukids, was an unusual and unexpected development. The area was so remote that till the 11th century, it had remained a Hindu enclave surrounded by Muslim principalities. It was converted to Islam in the early part of the 12th century after Mahmud raided it, and left teachers to instruct the Ghurids in the precepts of Islam. Even then it is believed that paganism, i.e. a variety of Mahayana Buddhism persisted in the area till the end of the century. The language of the Ghurids is subject to some controversy. What is known with certainty is that it was considerably different from the Persian used as literary language at the Ghaznavid court. Nevertheless, like the Samanids and Ghaznavids, the Ghurids were great patrons of Persian literature, poetry, and culture, and promoted these in their courts as their own. There is nothing to confirm the recent surmise (as claimed in the Paṭa Khazāna) that the Ghurids were Pashto-speaking, and there is no evidence that the inhabitants of Ghor were originally Pashto-speaking. Contemporary book writers refer to them as the "Persianized Ghurids". A certain Ghori prince named Amir Banji, was the ruler of Ghori and ancestor of the medieval Ghori rulers. His rule was legitimized by the Abbasid caliph Harun al-Rashid. Before the mid-12th century, the Ghoris had been bound to the Ghaznavids and Seljuks for about 150 years. Beginning in the mid-12th century, Ghor expressed its independence from the Ghaznavid Empire. In 1149 the Ghaznavid ruler Bahram-Shah of Ghazna poisoned a local Ghori leader, Qutb al-Din Muhammad, who had taken refuge in the city of Ghazni after having a quarrel with his brother Sayf al-Din Suri. In revenge, Sayf marched towards Ghazni and defeated Bahram-Shah. However, one later year, Bahram returned and scored a decisive victory against Sayf, who was shortly captured and crucified at Pul-i Yak Taq. Baha al-Din Sam I, another brother of Sayf, set out to avenge the death of his two brothers, but died of natural causes before he could reach Ghazni. Ala al-Din Husayn, one of the youngest of Sayf's brothers and newly crowned Ghurid king, also set out to avenge the death of his two brothers. He managed to defeat Bahram-Shah, and then had Ghazna sacked and burned and put the city into fire for seven days and seven nights. It earned him the title of Jahānsūz, meaning "the world burner". The Ghaznavids retook the city with Seljuq help, but lost it to Oghuz Turks. In 1152, Ala al-Din Husayn refused to pay tribute to the Seljuks and instead marched an army from Firozkoh but was defeated and captured at Nab by Sultan Ahmed Sanjar. Ala al-Din Husayn remained a prisoner for two years, until he was released in return for a heavy ransom to the Seljuqs. Meanwhile, a rival of Ala al-Din named Husayn ibn Nasir al-Din Muhammad al-Madini had seized Firozkoh, but was murdered at the right moment when Ala al-Din returned to reclaim his ancestral domain. Ala al-Din spent the rest of his reign in expanding the domains of his kingdom; he managed to conquer Garchistan, Tukharistan, and Bamiyan, and later gave Bamiyan and Tukharistan to Fakhr al-Din Masud, starting the Bamiyan branch of the Ghurids. Ala al-Din died in 1161, and was succeeded by his son Sayf al-Din Muhammad, who shortly died two years later in a battle. Sayf al-Din Muhammad was succeeded by his cousin Ghiyath al-Din Muhammad, who was the son of Baha al-Din Sam I, and proved himself to be a capable king. 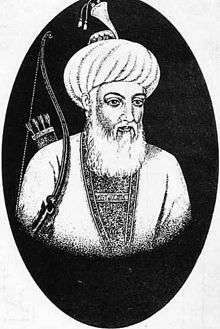 Right after Ghiyath's ascension, he, with the aid of his loyal brother Mu'izz al-Din Muhammad, killed a rival Ghurid chief named Abu'l Abbas. Ghiyath then defeated his uncle Fakhr al-Din Masud who claimed the Ghurid throne and had allied with the Seljuq governor of Herat, and Balkh. In 1173, Mu'izz al-Din Muhammad reconquered the city of Ghazna and assisted his Ghiyath in his contest with Khwarezmid Empire for the lordship of Khorasan. Mu'izz al-Din Muhammad captured Multan and Uch in 1175 and annexed the Ghaznavid principality of Lahore in 1186. He was alleged by contemporary historians to exact revenge for his great grandfather Muhammad ibn Suri. After the death of his brother Ghiyath in 1202, he became the successor of his empire and ruled until his assassination in 1206 near Jhelum by Khokhar tribesmen (in modern-day Pakistan). A confused struggle then ensued among the remaining Ghūrid leaders, and the Khwarezmids were able to take over the Ghūrids' empire in about 1215. Though the Ghūrids' empire was short-lived, Mu'izz al-Din Muhammad's conquests strengthened the foundations of Muslim rule in India. On his death, the importance of Ghazna and Ghur dissipated and they were replaced by Delhi as the centre of Islamic influence during the rule of his successor Sultans in India. The Ghurids were great patrons of Persian culture and literature and lay the basis for a Persianized state in India. 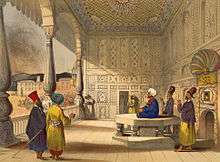 They also transferred Iranian architecture of their native lands to India, of which several great examples have been preserved to this date (see gallery). However, most of the literature produced during the Ghurid era has been lost. Out of the Ghurid state grew the Delhi Sultanate which established the Persian language as the official court language of the region – a status it retained until the late Mughal era in the 19th century. Blue shaded rows signifies Ghurid vassalage under the Ghaznavids. Yellow shaded rows signifies Ghurid vassalage under the Seljuks. 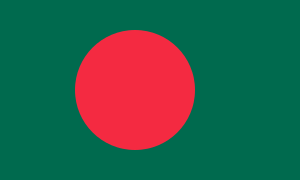 Green shaded row signifies Ghurid vassalage under the Khwarazmian dynasty. 1 2 Firuzkuh: the summer capital of the Ghurids, by David Thomas, pg. 18. 1 2 The Grove Encyclopedia of Islamic Art & Architecture: Three-volume set, by Jonathan Bloom, Sheila Blair, pg. 108. ↑ C. E. Bosworth: GHURIDS. In Encyclopaedia Iranica. 2001 (last updated in 2012). Online edition. ↑ Finbarr Barry Flood, Objects of Translation: Material Culture and Medieval "Hindu-Muslim" Encounter, (Princeton University Press, 2009), 13. 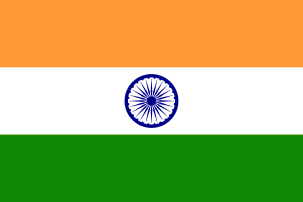 ↑ A short history of India: and of the frontier states of Afghanistan, Nipal, and Burma, Wheeler, James Talboys, (LINK): "The next conqueror after Mahmud who made a name in India, was Muhammad Ghori, the Afghan." ↑ G. Morgenstierne (1999). 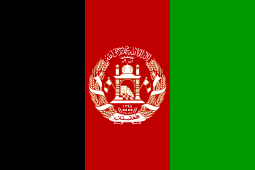 "AFGHĀN". Encyclopaedia of Islam (CD-ROM Edition v. 1.0 ed.). Leiden, The Netherlands: Koninklijke Brill NV. 1 2 M. Longworth Dames; G. Morgenstierne; R. Ghirshman (1999). "AFGHĀNISTĀN". Encyclopaedia of Islam (CD-ROM Edition v. 1.0 ed.). Leiden, The Netherlands: Koninklijke Brill NV. "... there is no evidence for assuming that the inhabitants of Ghūr were originally Pashto-speaking (cf. Dames, in E I1). If we are to believe the Paṭa Khazāna (see below, iii), the legendary Amīr Karōṝ, grandson of Shansab, (8th century) was a Pashto poet, but this for various reasons is very improbable ..."
↑ Encyclopaedia Iranica, "Ghurids", C.E. Bosworth, (LINK): ". . . The Ghurids came from the Šansabānī family. The name of the eponym Šansab/Šanasb probably derives from the Middle Persian name Wišnasp (Justi, Namenbuch, p. 282). . . . The chiefs of Ḡūr only achieve firm historical mention in the early 5th/11th century with the Ghaznavid raids into their land, when Ḡūr was still a pagan enclave. Nor do we know anything about the ethnic stock of the Ḡūrīs in general and the Šansabānīs in particular; we can only assume that they were eastern Iranian Tajiks. . . . The sultans were generous patrons of the Persian literary traditions of Khorasan, and latterly fulfilled a valuable role as transmitters of this heritage to the newly conquered lands of northern India, laying the foundations for the essentially Persian culture which was to prevail in Muslim India until the 19th century. . . ."
↑ Encyclopaedia of Islam, "Ghurids", C.E. Bosworth, Online Edition, 2006: "... The Shansabānīs were, like the rest of the Ghūrīs, of eastern Iranian Tājik stock ..."
↑ Encyclopaedia of Islam, "Ghurids", C.E. Bosworth, Online Edition, 2006: "... There is nothing to confirm the recent surmise that the Ghūids were Pashto-speaking [...] the Paṭa Khazāna "Treasury of secrets", claims to include Pashto poetry from the Ghūid period, but the significance of this work has not yet been evaluated ..."
↑ Ghurids, C.E. Bosworth, Encyclopedia of Islam, Vol.2, Ed. Bernard Lewis, C. Pellat and J. Schacht, (E.J.Brill, 1991), 1100. ↑ The Iranian World, C.E. Bosworth, The Cambridge History of Iran, Vol. 5, ed. J. A. Boyle, John Andrew Boyle, (Cambridge University Press, 1968), 163. ↑ Balaji Sadasivan, The Dancing Girl: A History of Early India, (ISEAS Publishing, 2011), 147. ↑ Persian Literature in the Safavid Period, Z. Safa, The Cambridge history of Iran: The Timurid and Safavid periods, Vol.6, Ed. Peter Jackson and Laurence Lockhart,(Cambridge University Press, 1986), 951;"...Ghurids and Ghurid mamluks, all of whom established centres in India where poets and writers received ample encouragement.". C. Edmund, Bosworth (2001). "GHURIDS". Encyclopaedia Iranica, Online Edition. Retrieved 5 January 2014. Frye, R.N. (1975). "The Ghaznavids and Ghūrids". In Frye, R.N. The Cambridge History of Iran, Volume 5: The Iranian world. Cambridge: Cambridge University Press. pp. 157–165. ISBN 0-521-20093-8.